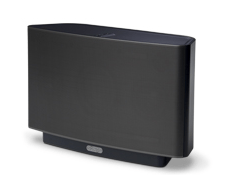 It is rare that I’ll plug a product here on my blog but the Sonos system is worthy. I’ve used a zillion ways to listen to MP3’s over the years; iTunes, an early Roku box, Ipod’s, a Dell MP3 box that connected to my stereo. They all pale in comparison to Sonos. I’ve looked but never bought Sonos’ prior products as they all needed to be connected to a stereo. I gave up on full stereo systems years ago as I liked the small format of an iPod docked into a powered speaker. Then I saw the Sonos S5 in black on Amazon and I read the reviews. What Kool-aid were these people drinking! Sixty-Two 5 star reviews out of 75, unseen before on amazon. I did not believe them so I read cnet , NYT, and the WSJ. They all agreed so I bought it for my office. Set it up and bought my second one for my living room a day later. 1. It sounds great. I’ve run a sound board on many an evening and have a decent ear. The 5 speakers powered by 5 dedicated digital amps do a great job for such a small 50w format. 2. It is easy to set up. I’m buying my folks one for the holidays as providing tech support for iTunes is getting old. 3. The iPad application to control the Sonos is very…very nice when lying in bed. 4. The mesh wireless technology really works. I was a sceptic but I’m eating crow. 5. I now listen to LastFM all the time and it is so much easier than building play lists from iTunes of my own library. 1. I need to pay to listen to the Sirius radio I already have in my truck (I’m thinking about it). 2. I Don’t love the UI of the Mac desktop software compared to the Ipad which is much more usable. 3. It seriously cut into the music that I buy on iTunes and Amazon to the point I’m thinking about going all digital with Napster. Disturbing but true with 11 million tracks for $8 a month I would save a ton vs buying. If you are pro music go buy one. Or two. Or maybe Three. As Sonos is life altering in how you will listen to and consume music.